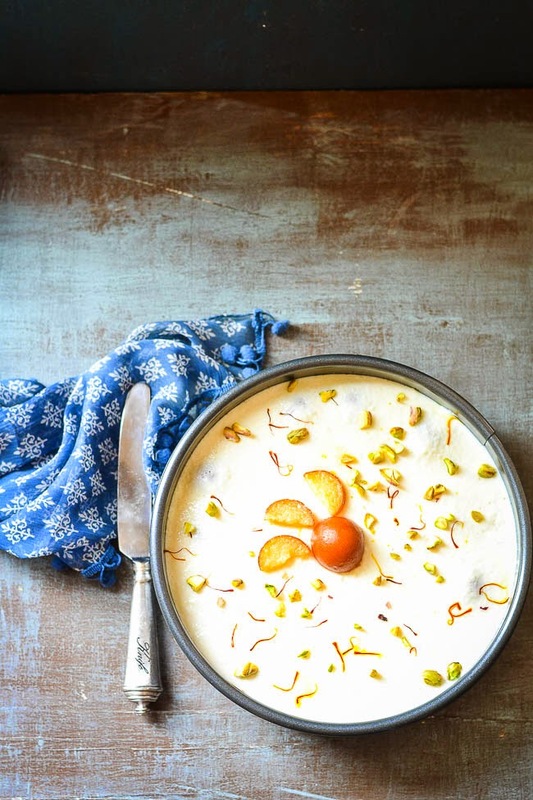 Today let me share the recipe of this unique fusion dessert that I came across recently while surfing some social media group. 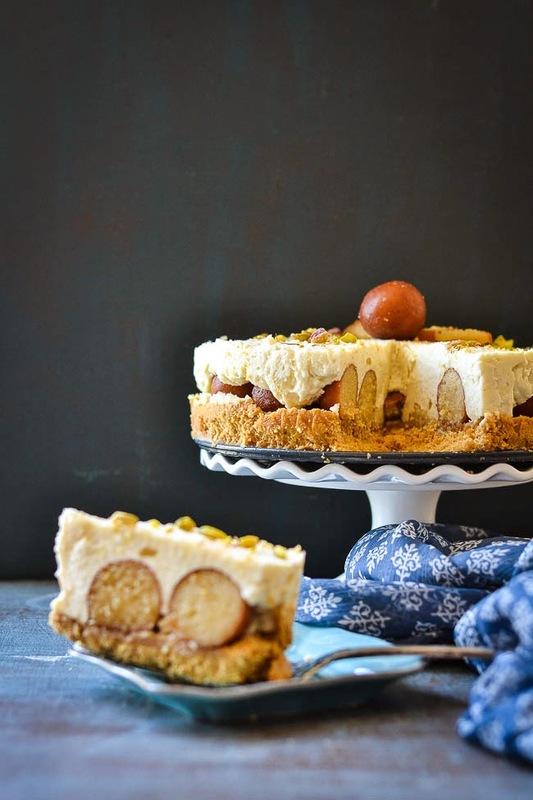 The name of the dessert is Gulab Jamun Cheese Cake. Fusion food is the latest cool concept in culinary world and this trend has brought Innovation at its best. It takes the ideas from different cuisines and combines them into a single eating experience. It’s becoming more popular India with western food chains growing their market there. If you go to a Pizza Hut in India, you will see Paneer or Kadai chicken Pizza in the menu. 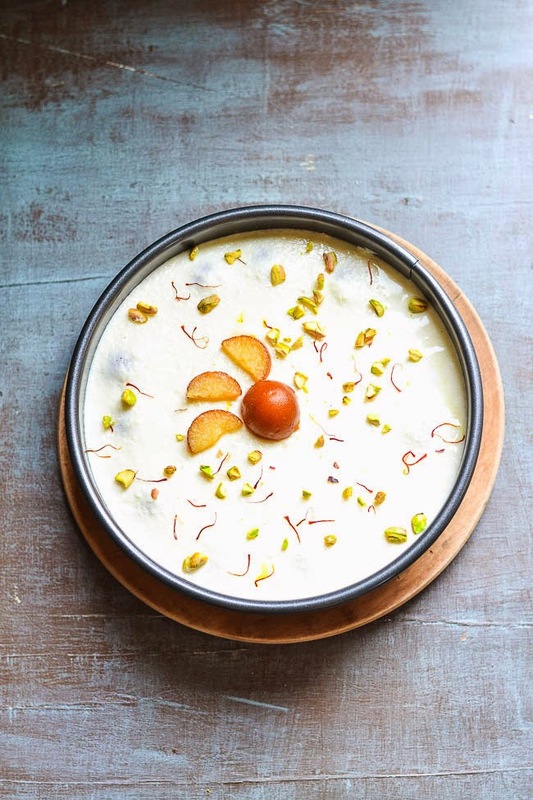 The popular dessert brands are bringing fusion dishes where Indian sweets are mixed with western cakes or cookies. My today’s recipe is inspired by this concept of west meeting east. When small pieces of gulab jamun are placed in between the cheese and biscuit part, it forms such a delightful combination. 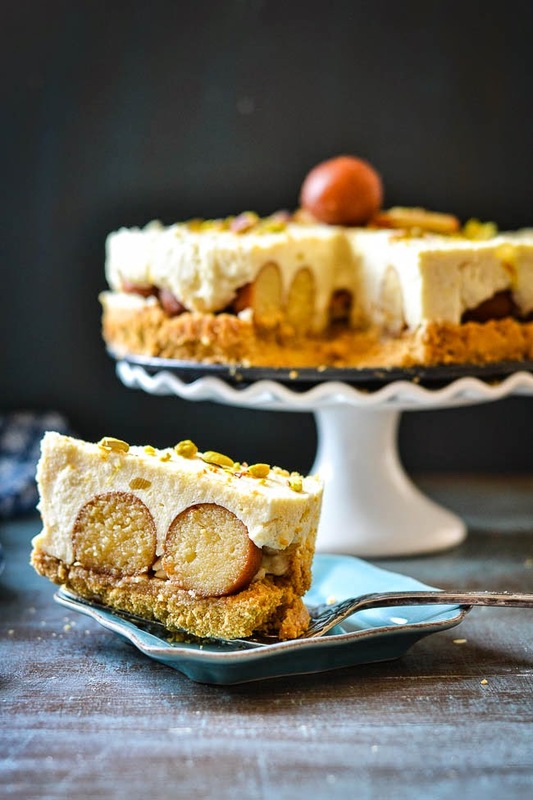 Nothing can get better when Light creamy cheesecake bursting with delicate flavor and sweetness of gulab jamun come together. Cheesecakes are classic but elegant desserts. You are spoilt of choices because there so many different types of them. Specifically the one I tried with is one version of egg-less and no-bake cheesecakes. You wouldn’t need to turn on your oven for this cheese cake. No-bake cheesecakes are more like "curd" desserts. They are usually made by blending room-temperature cream cheese with sweetened, condensed milk and placing the mixture in a graham cracker crust. It needs to be refrigerated in order to be set. I have tried the usual cheesecakes many times and those are generally with egg and baked ones. I never made this type of no-bake cheesecake and so was hesitant to make the first attempt. I went through couple of recipes from internet. Finally liked Sanjeev Kapoor's Gulab Jamun Cheesecake recipe and followed the steps. 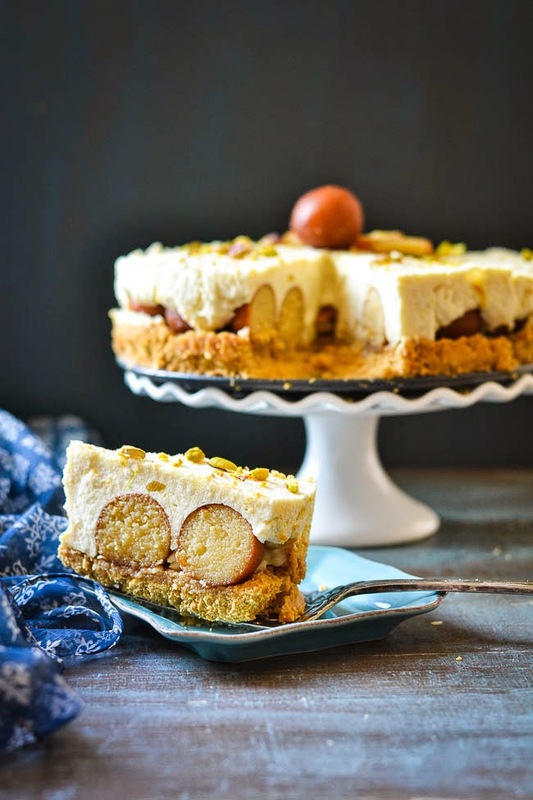 Recipe of Gulab Jamun Cheesecake : for 8 inch or 9 inch round cake. Graham Cracker mix : one pouch - or take 10 digestive biscuits and crush it to a powder. Saffron + chopped pistachios for decoration. 1. Melt the butter and add it to the crushed biscuits and mix it nicely. 2. Spray the springform pan with cooking oil and Line it with the graham cracker mixture. Spread evenly and press gently. Refrigerate it to set. It will take 25 minutes to 30 minutes. 3. Add the gelatin in 1/4 cup of warm water, set it aside for couple of minutes. 4. 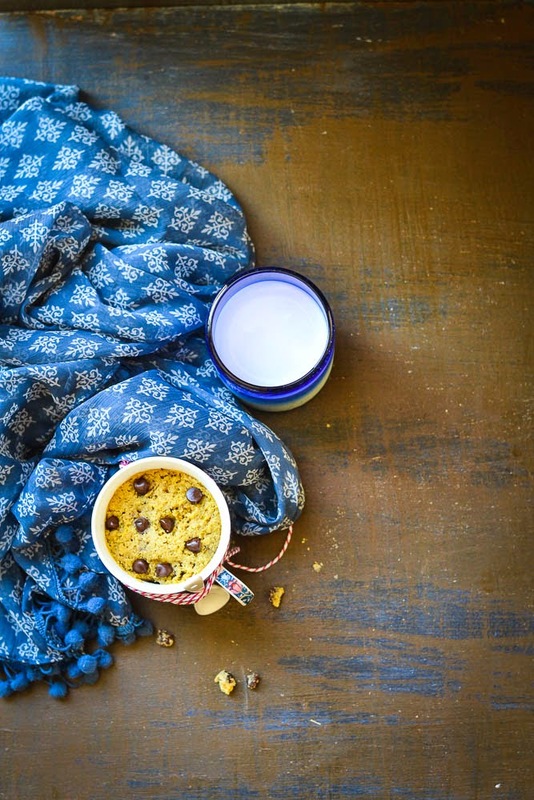 Take a blender and mix grated paneer, Greek yogurt and condensed milk together. Add the gelatin mixture and again mix it nicely. 5. Take the pan out from refrigerator, spread the jamuns, pour paneer mixture on it. Spread it evenly and put it in the refrigerator until it is set. 6. Dip the pan into warm water for 5 to 10 seconds, loosen edges with a knife and open the springform pan. 7. 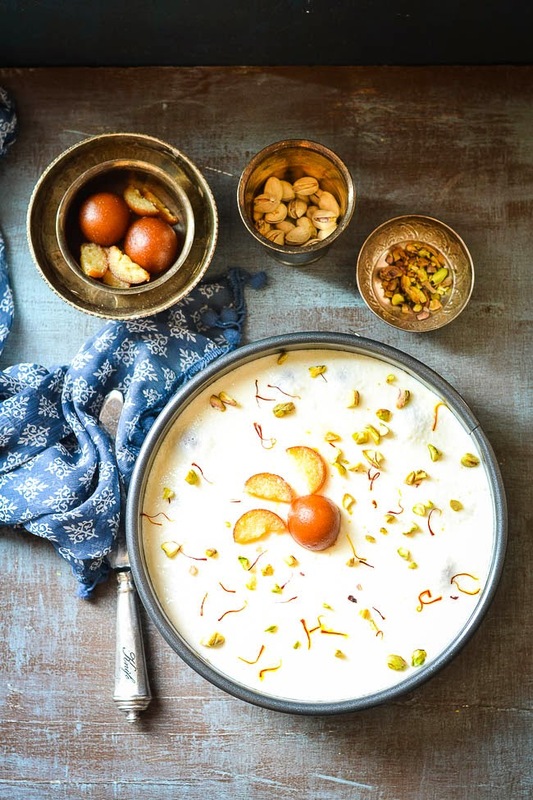 Sprinkle saffron strands and chopped pistachios on the top and cut it into pieces and serve chill. The idea of today's recipe is nothing new, but I had never tried this myself until last week. I am talking about a chocolate chip cookie in a cup. 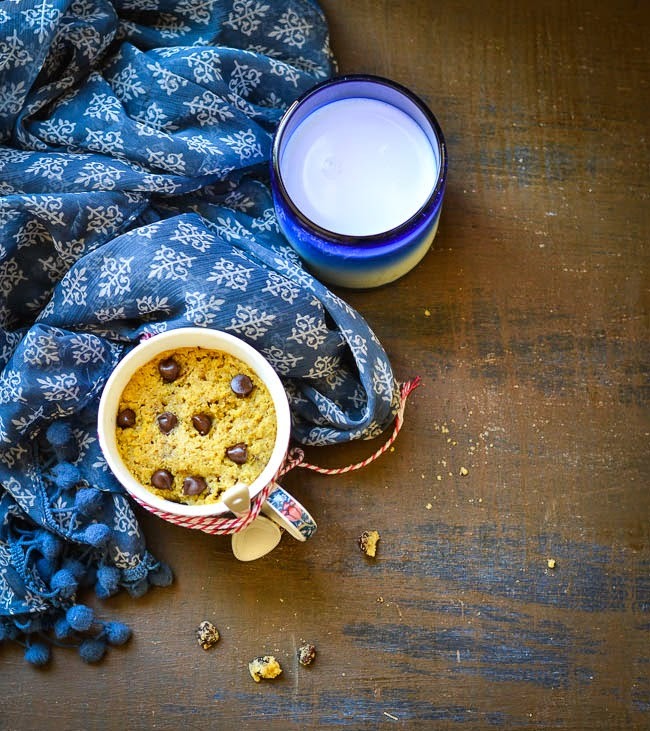 A single, gooey, hot chocolate chip cookie. It's “baked” in the microwave in a little mug. 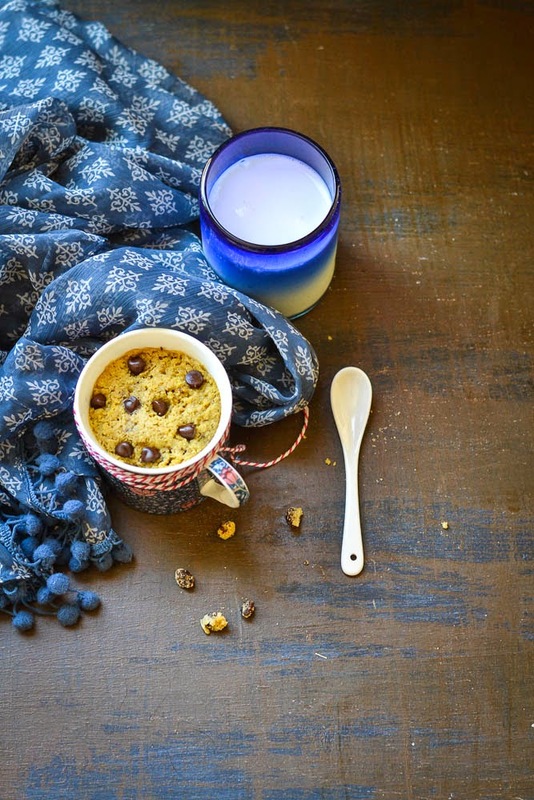 It’s easy, it’s yummy and it satisfies your cookie cravings, specially when you are ultra bored with your work life in the middle of the week. 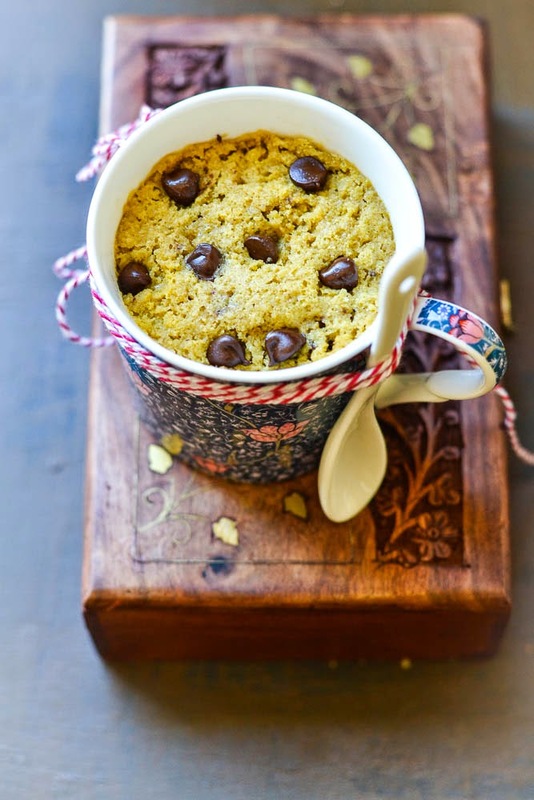 This one minute mug cookie takes only seconds to make and that too with very little effort. The process doesn't involve perfect scooping or any messy clean up that usually needs to do when you bake cookies in the traditional way. It just needs a handful of basic ingredients, a mug and a spoon to relish it. So the best part of today's recipe is how easy and quick it can be prepared. The recipe is adopted from "number-2-pencil.com". Single-serving desserts offer another advantage. You don’t have to eat the whole batch of cookies and you can still satisfy your sweet tooth. There will be no leftovers and no repeated eating of the same thing. So there is no need to think about increasing your waistline. Earlier I tried to make microwave cake too but honestly speaking I liked Microwave cookies more and think that they are just wow and truly gooey. It tasted like a real chocolate chip cookie fresh from the oven. You can make fun additions like add a scoop of ice-cream or peanut butter or whipping cream and make your most amazing cookie experience memorable. 1. Take a small mixing bowl, add the butter and microwave it for 30 sec or until it just melts. 2. Add sugars, vanilla extract and salt. Stir to mix it until well-combined. 3. Add the egg yolk to the bowl and stir to combine. 4. Add flour and mix it again. Add the chocolate chips and give a final stir. 5. 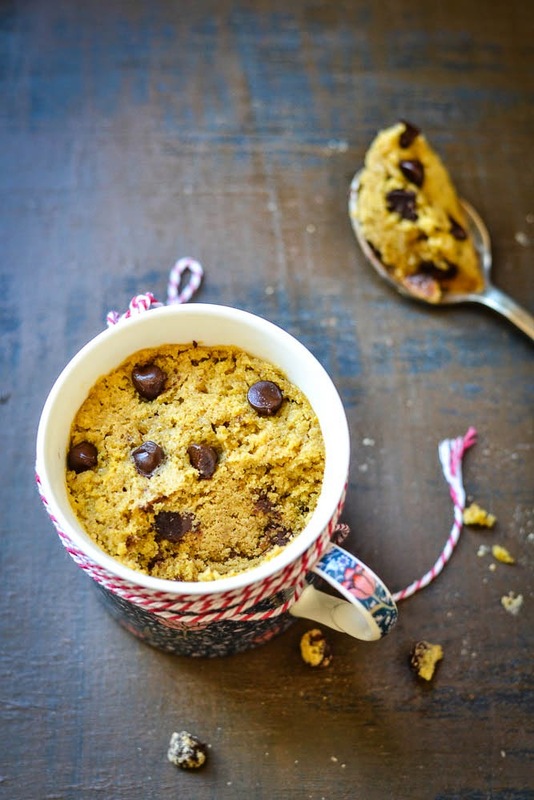 Now transfer the cookie dough in a microwave-safe mug. Cook it for 40 to 50 seconds. Check after 40 seconds. Do not over cook, just like a regular cookie, it will become hard as it cools down. Serve warm with a scoop of ice cream. Take one tablespoon butter and an egg yolk, mix to combine. Add 5 tablespoons of cookie mix to it and mix it again. Microwave the mixture for 40 to 50 seconds.